PHOTO BY NICOLE WALBY Linda Reis, vice president, secretary and treasurer of Ballreich Potato Chips and Snacks, thanks the committee for being recognized as the recipient of the Established Entrepreneurs Award along with her daughter Haley Thomas, director of sales and marketing, Tuesday morning. 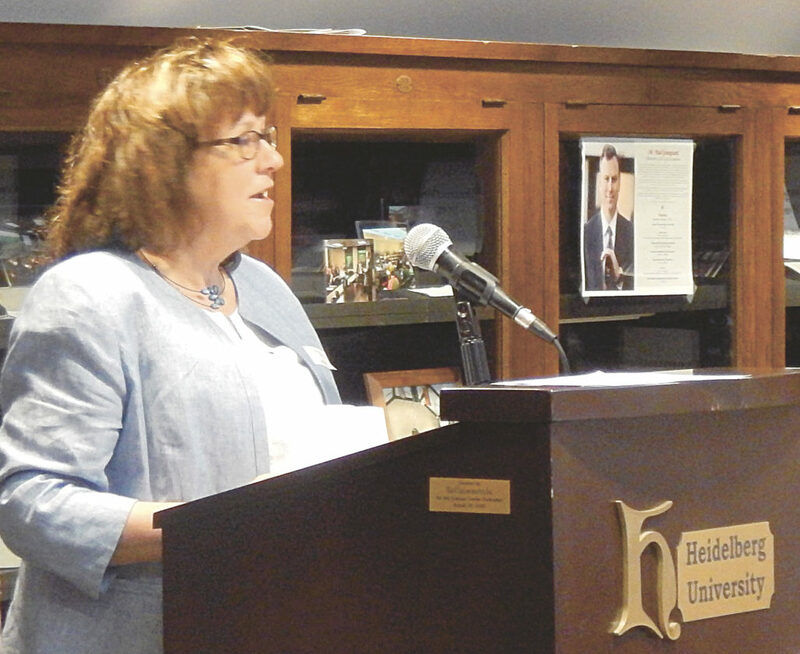 Four local female entrepreneurs were recognized Tuesday morning during Heidelberg University’s School of Business Celebrating Women Entrepreneurs awards ceremony. Women recognized included Lori Mastro, executive vice president of operations and regional manager of the Mastro Group Units, earning the New Entrepreneur Award; Sharon Gosche, owner of Clover Club, earning the Lifetime Achievement Award; and Linda Reis, vice president, secretary and treasurer and Haley Thomas, director of sales and marketing — both of Ballreich Potato Chips and Snacks — earning the Established Entrepreneurs Award. Since starting with the Buffalo Wild Wings chain 14 years ago, Mastro has overseen the building and/or remodeling of three additional Buffalo Wild Wings Bar and Grill restaurants, including the location in Tiffin, which opened in June 2016. “I just want to thank the committee for this honor,” Mastro said. Gosche’s life chronicles 50 years of personal interest and involvement in local business. She started at the age of 13 at Meadowbrook Park in Bascom selling snow cones. Her ventures since then have included operation of six group homes in the mental health field and owning and operating Clover Club, which she purchased in 1997. Gosche is a founding board member for Court-Appointed Special Advocates, a former trustee of the Elks and member of the American Veterans Association, Eagles, Knights of Columbus and VFW. In 2006, Reis left the corporate world to join her husband, Brian, at Ballreich. There, she leads all new projects such as product launches, software implementations and process improvements with project plans. Reis’ leadership assisted the company to grow its workforce from 36 to more than 90 employees in less than 10 years. Reis said while working with other companies, she always felt people who owned their own businesses “had it made.” Since then, she had come to understand the hard work and responsibility to make sure they are doing everything right for their employees and for the company as a whole. Thomas, who is Reis’ daughter, worked in real estate in Charlotte, North Carolina, and Cleveland prior to joining the family business. She leads the the innovation team in introducing new chip flavors, such as sweet potato chips and potato sticks. Also, she received the company’s first two patents and is directing the research team to produce non-GMO snacks and exotic vegetable chips. Thomas said there are two things in business that she has learned over the year: it is never the right time to do the wrong thing, and perseverance always prevails.